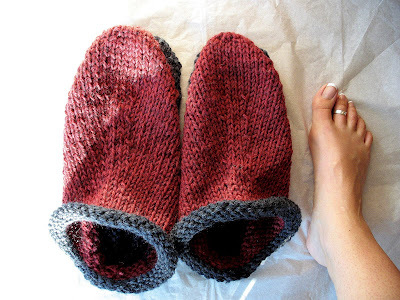 Do you charity knit for the holidays? Last year I participated in Knit Unto Others, which is hosted yearly by Carole & Margene. The concept is to charity knit during the last two weeks of November. At the end of the month, you send them an email stating what you knit & where you donated it to, and your name is entered into a drawing to win a prize from either Carole or Margene. Last year, I did win a prize from Margene, but honestly, just knowing that someones head was kept warm because of hats I knit, was gift enough. One of the charities I’ll be knitting for again this year is Christmas Knits to help One at a Time Ministries, and Lynda just reminded me on her blog post that it’s that time of year again. I’m sure there’s a hat pattern or two I’ve been wanting to try that would be perfect for this charity. How about you? On the health front, my doctor asked me to try some medication for the FMS and after being on it for 2 weeks, my pain levels have dropped by about 40%. YEAH! I’ve had a “bad” day here & there, but my overall daily pain is much improved. I’ve had no side effects from the medication (that I’ve noticed) so that’s great, and DH has especially noticed a change in me since he can now give me a squeeze now & then without me screeching in pain. The other good thing is that the NutriSystem diet is working. My body resisted for the first 10 days though, but now that it knows I’m sticking with it and not cheating, it finally gave up some pounds and as of today, day 15, I’ve lost 5.5 pounds. Some of the food is great and some of it is not so great, but I’m sorting through it so I can customize my next order. The best part is that I’m not ever hungry. That is definitely a first for me. I’ve never been on a diet where I haven’t been completely miserable, and honestly it barely feels like I’m on a diet right now. In actual knitting project news, there is actually quite a bit going on. After seeing this list, I think it’s time to buckle down and get things blocked, felted, and photographed. Sheesh. Jillian shared this on her blog and I’m passing along to all of you as well. There’s a Veterans Day yarn sale going on over at Sonny & Shear. Use the coupon code VETERAN to save 20% off of your yarn purchases now through November 17, 2007 and all orders over $40 have free shipping. There are a lot of wonderful things that are unfortunately sold out, but I did snag some Lorna’s Laces & Dream in Color. How could I not? I will not bore you all for the hundredth time with my woeful tales of fibromyalgia. Instead, I will bore you with my woeful tales of my huge behind. It follows me everywhere and is just taking up too much room, so it must go. Not to mention, none of my clothing fits anymore and so I must lose the weight or buy a new wardrobe. Personally, I don’t want some skinny salesgirl to find me weeping on the floor of some dressing room while trying on clothing, so I’ve opted to change my diet. In the past if I found myself with an extra pound or five hanging on my behind, I’d just up my workouts and off it would go. Actually, at one time I was on the thin & fit side of normal, but that’s because I was working out for at least an hour a day. These days though, exercise is almost impossible (curses to the fibromyalgia). I can go for a small walk, but as far as getting up my heart rate, it’s not happening. At least for right now. I’ve tried to watch what I eat, the quantity of the food and the quality. But honestly, I’m just watching it all go from my plate, to the fork, to my mouth so that isn’t working at all. I decided after much research to try the NutriSystem diet plan. Normally, I’m against pre-packaged foods and such, but at this stage, I’m at the end of my rope and I’m out of control and I’m more tired of being fat than I am against this diet. It’s also helpful that I’ve dragged my husband into the whole thing so we’ll be suffering together. Misery loves company. I’ll be posting occassionally about my dieting adventures and I’ll either warn you in the title so you can skip it, or I’ll try to add some yarny goodness so you’ll have something of interest to see. Regardless, I do think I need to share my experiences on this diet to help keep me sane and since you’re all my friends, you’re really the only ones I feel comfortable sharing this all with. 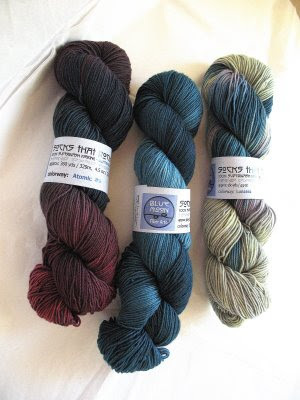 3 beautiful skeins of STR lightweight in Atomic #6, Spinel and LunaSea. Of course since Blue Moon Fiber Arts releases their Raven collection in less then one and a half hours (6pm PST on November 5th), I’m sure you’ll be seeing more STR on my blog soon.